We are nearing the end of our Genius Hour journeys for this year. This week, I will ask students to complete a project check-in form reflecting on their growth and genius as the process turns towards the product. In the process, students have researched, blogged, prepared elevator pitches, written proposals, and crafted an annotated bibliography. Now, they are in the last stages of structured research, class work, and analysis as they begin to use what they have learned to produce some sort of product to reflect that learning. And I’ll be sure to share those products in a few weeks. I’ll also blog about my students’ reflections and self-evaluations, and hope to have a few of them guest blog for me right here to share their experiences. This year, I really pushed students to go beyond researching other people’s ideas to creating their own findings through action research. Most students either conducted surveys or interviewed experts, and the process of conducting this research was an interesting learning curve for us all. Below, I share some reflections on the action research process and some of my students surveys. It would be great if you could take a few minutes and respond to a few or share with your students and colleagues! Find more of my recent writing on Genius Hour in Sharing Students’ Genius: A #GeniusHour Reflection and Developing Genius: Reflecting on Choice, Passion, and #GeniusHour. For my students’ blogs and work, visit geniushour.aschoenbart.com. As a doctoral student, survey design and questioning is always on my mind. This certainly worked for my students because I was able to help them develop stronger and more objective questions. It also led me to probably hold them to higher standards. I asked all students to make an attempt at action research and required everyone to have their surveys, e-mails, or questions proofed and approved by me. Some students ended up with projects that just didn’t need other people’s expertise. Others clearly favored one research tool over another. For some, their attempts at experts didn’t pan out and no one responded. I wanted to try to make research more real, living, and authentic for students--and for many, it really worked. One student interviewed his mom and aunt to learn about a career in accounting. Another is in the process of filming interviews with students about their opinions on heavy metal music. In one of my favorite examples, Lauren wanted to study classroom design and space. Her goal was to design a better classroom, considering aspects like light, furniture, space, color, etc. I told her that if her work is promising she can have my classroom and redesign it however her research conclusions and analysis show to be effective. Then, I demonstrated the power of social media to find experts to help Lauren. With a few Tweets, Lauren was well connected with teacher-experts on classroom design, and on her way. Find Lauren’s blog and work here. Emma’s work took action research to another level. 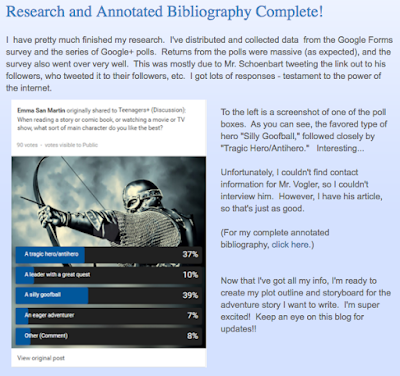 To study the hero’s journey and story structure, she created a Google Form and posed questions on popular Google+ Communities. 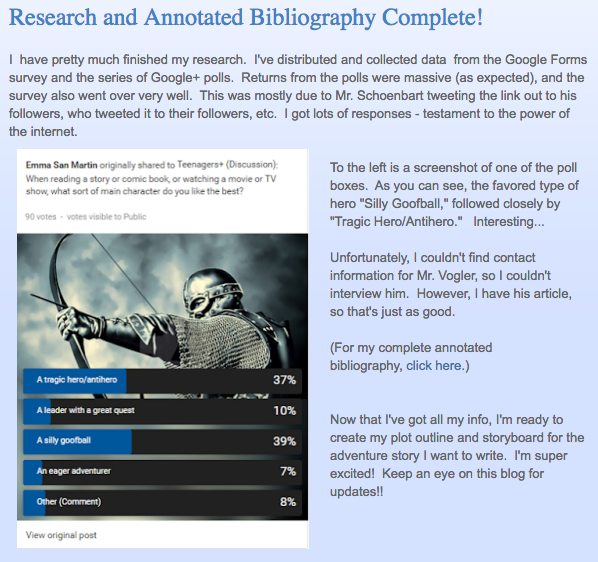 Read her blog, take her poll, to learn more about the ingredients of a hero’s story. She is well on her way to having meaningful data from a range of authentic sources to analyze her audience's interest in heroes. A screenshot from Emma's blog. Since our main data pool is students, surveys must be be short and easy to complete. Always consider question types with purpose; when and why should you ask a qualitative question vs. a quantitative one? I also constantly framed design through my lens as a student: it’s difficult to get it right. The students’ work isn’t all perfect, but it’s thoughtful, purposeful, and interesting. Please consider taking a closer look at some of the blogs and surveys below. For more on our Genius Hour work, visit geniushour.aschoenbart.com. The examples above are just some of the great ideas being explored by my students. They are also some of the ones that had surveys and action research ready to share. Through Genius Hour, I hope to not only push my students to develop important skills and passions, but to make research more authentic and meaningful. I’m excited about their progress, about the variety of interesting topics, and about the results they are developing. I hope you will take some surveys, read some blogs, and help my students become geniuses. How have you used action research in schools or with students? What advice do you have for teaching students to create, use, and analyze surveys or data? Please share in the comments or on Twitter. Great blog post. I'm in my second iteration of genius hour projects. The action research piece was missing from my projects. Just today I suggested to my students to reach out to a subject matter expert on their topic, but I lacked the structure necessary for that interaction to be affective. Thanks for sharing and helping me bring structure to this component of the project. Thanks, Demetrius! This is my second year with Genius Hour, too. I find that the action research builds some important skills and rigor in the process, but isn't necessary for every student or project. I'm glad you found the ideas and post useful.